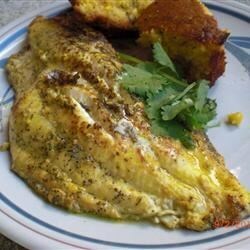 "A fast and easy but tasty and delicious catfish preparation with bite. You can vary the recipe by adding a layer of honey or using honey mustard. Also great with tuna!" Pat the catfish dry, and spread a layer of mustard over the surface. Place the cracked pepper onto a plate, and press the coated catfish into the pepper so it is well covered. Heat the olive oil and butter in a large skillet over medium-high heat. Fry the catfish for 3 to 5 minutes on each side, or until fish flakes with a fork. I guess it's okay if you go easy on the pepper, if not, I hope you like burning your mouth! This was excellent. I added a little paprika and cayenne pepper to spice it up a little more. Pretty good...used honey mustard and instead of pepper, used some Old World Central Street Seasoning from the Spice House. This was very easy to make and especially tasty. Paired it with brown rice and Creole Okra (also from this site). I used fillets instead of the whole fish and it came out great!